July 6, 2016. The Netherlands. Garderen. Sportpark De Westeneng. 19 degrees. 350 spectators. Paulo Fonseca has fielded internationals in a friendly game for the first time. The starting line-up featured the recently arrived Andriy Pyatov, Bohdan Butko and Taras Stepanenko. At the same time, the Pitmen’s mentor could not count onIsmaily and Mykyta Shevchenko, who have been recovering from injuries. From the off, Shakhtar dominated the game. As early as the opening stages, Marlos struck just wide, with Dentinho taking a bicycle kick from about 15-metre range in the following attacking move – the shot turned out spectacular, but not dangerous at all. They managed to convert their dominance into a goal on 14 minutes. Mykola Matviienko earned a free kick on the left wing. Bernard made a delivery, with Ordets heading it into the back of the net – 0-1. Immediately afterwards, the Donetsk team could have scored another one. Bernard ran upfield to counterattack and struck from the edge of the box just to see his effort hit the woodwork. Club Brugge responded with Izquierdo finding himself one-on-one withAndriy Pyatov. Shakhtar goalkeeper showcased perfect reflexes and won the duel. The champions of Belgium managed to equalise on 27 minutes. Nikola Storm decided to make a long-range shot, with the ball taking deflection just off into the far corner – 1-1. However, Shakhtar left for the break being in front. Fred earned a spot kick and executed the punishment himself by sending the ball into the left-hand corner to make it 1-2. At the start of the second half, Paulo Fonseca made a few substitutions, fielding Kanibolotskyi, Seleznyov, Nem, Taisonand Eduardo. Shakhtar for a long while could not create a scoring chance near the opponents' goal, while Club Brugge converted theirs. In the 66th minute, Jelle Vossen made it 2-2. Yevhen Seleznyov could have levelled it, but his powerful shot into the near corner was parried away by the keeper. The closing fifteen minutes of the game passed with the Orange-Black side dominating it, however the Belgians’ tight defence was impeccable. 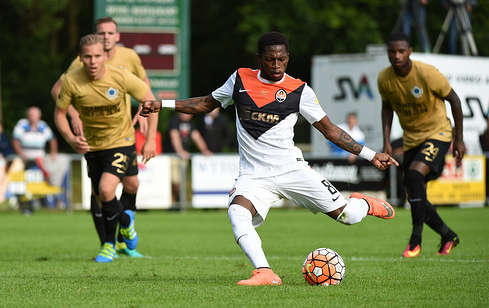 Shakhtar and Club Brugge ended up in a 2-2 stalemate. The charges of Paulo Fonseca will have their next friendly game on July 9 vs Nordsjælland.